Three-hole punched to fit into a binder for easy access. Features clear, concise definitions for more than 20,000 entries. Includes special sections on basic English grammar, abbreviations, 10 general spelling rules and 10 rules for forming plurals. 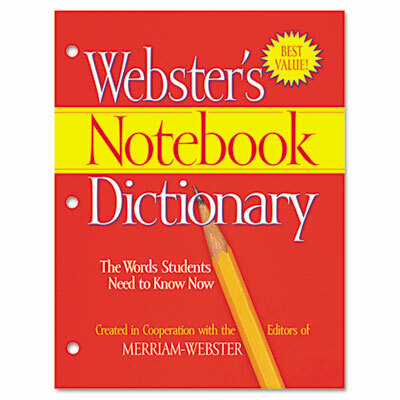 This handy dictionary is three-hole punched to fit into a binder for easy access and portability at home or at school. Features clear, concise definitions of the words students need to know—more than 20,000 entries. Easy-to-read page design. Includes special sections on basic English grammar, abbreviations, 10 general spelling rules and 10 rules for forming plurals.